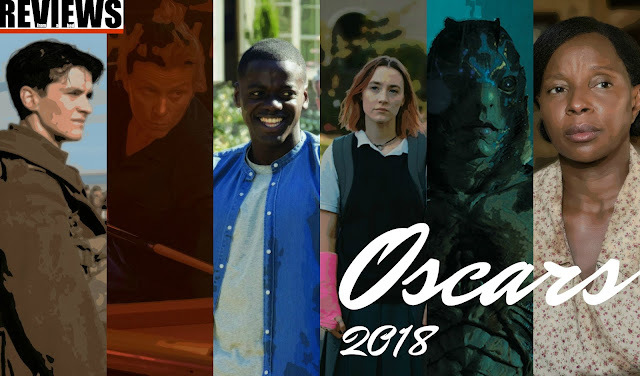 Here we are once again with the 2018 Oscar nominations and while I attempt to limit any coverage of the awards season hoopla (simply because there are so many to cover and too little to care about) the Academy Awards are obviously the biggest show of the season and so it was with great anticipation I awaited this morning’s announcements. What has been great about this year's award season thus far is the seeming lack of any clear front-runner. There have been so many films vying for the attention of awards season audiences this season, including a few that hardly got noticed at all including The Florida Project and The Disaster Artist, and thus it has resulted in a field of nominees that, while more concentrated than I imagined, still leaves room for an open playing field come the night of the ceremony. Let's start with things I'm happy to see. Obviously, with Get Out being my choice for the best movie of 2017 I am thrilled to see writer/director Jordan Peele and his film not only grab a Best Picture and Original Screenplay nomination, but to also to see Peele get a directing nod as well as Daniel Kaluuya get nominated in the Best Actor category makes me ecstatic for the film's possibilities come the night the winner's are announced. This makes Peele the first African American to ever score Oscar nominations for Best Original Screenplay, Best Director and Best Picture for the same film. In other firsts, I have to imagine a Best Supporting Actress nominee isn't often nominated for writing/performing a Best Original Song nominee as well, as Mary J. Blige garnered both nods for her contributions to Dee Rees's Mudbound which, despite being distributed by Netflix, had a strong showing delivering another first by way of its cinematographer, Rachel Morrison, becoming the first female director of photography to be nominated for the Best Cinematography. Furthermore, Rees is also the first African American woman to be nominated for the Best Adapted Screenplay Oscar. Continuing in firsts, Logan is the first comic book movie to ever receive a writing nomination while I would have loved to have seen Hugh Jackman get a nod for his Wolverine swan song over Denzel Washington's replacement nomination for Roman J. Israel, Esq. in what would have been James Franco's spot had the sexual allegations against him not come out. And this is coming from a guy who enjoyed Roman J. Israel, Esq. more than most. Qualms aside, Washington just broke his own record for being the most nominated African-American actor, this year being his eighth nomination. Moving out of firsts to more the interesting facts side of things, but staying in the Best Actor race for the moment, Timothée Chalamet, at twenty-two, is the youngest actor to receive a nomination in that category since Mickey Rooney in 1940 and, if he were to win, would be the youngest winner of that award ever. Of course, the obvious choice in that category is Gary Oldman for Darkest Hour, but while his performance is fine and showy considering the stunt of the physical transformation I was not overly impressed with the film despite being a Joe Wright fan and an Anna Karenina supporter. Sure, the acting and make-up nominations were inevitable, but for the film to score a Best Picture nomination over plenty of other stellar choices like I, Tonya or even The Florida Project, The Big Sick, or Baby Driver all of which received minimal love in other categories just feels lazy, predictable, and most of all-boring. Not to get too negative, it was a big surprise to see Phantom Thread garner so much recognition in so many big categories. Having just seen the film for the first time late last night I'm still very much trying to process it, but while the Best Actor nomination for what is presumed to be Daniel Day Lewis's final on screen performance was a foregone conclusion to have Paul Thomas Anderson get a directing nod, the film get a Best Picture nod, and Lesley Manville score a Best Supporting Actress nomination is frankly surprising given its late entry in the awards season race. Not so surprising was the five nominations for Lady Bird which is a film I very much like and appreciate, but didn't love with the muster of some. Though it is beyond exciting to see a first time feature director not only get a Best Director nom, but to also garner an Original Screenplay nod for her sole screenwriting credit as well as for that film itself to then be nominated for Best Picture is the true triumph of multi-hyphenate Greta Gerwig's surreal run this awards season as Lady Bird will ultimately become the one we all love and the one who received it's due attention, but will undoubtedly walk home empty-handed at the end of the night. Original Screenplay is a maybe, but not likely. It was also not surprising to see Meryl Streep get her twenty-first nomination in the Best Actress category for The Post, but that film was shut out in nearly every other regard sans what feels like an obligatory Best Picture nom due to the involvement of some of Hollywood's biggest and most respected players. What is genuinely surprising is the Best Supporting Actor group as the hot take movie of this awards season, Three Billboards Outside Ebbing, Missouri, took two spots for Woody Harrelson and front-runner Sam Rockwell while neither of Call Me By Your Name's deserving supporting players in Armie Hammer and Michael Stuhlbarg received a nod. If nothing else, Stuhlbarg should have taken Harrelson or Christopher Plummer's nomination for not only that final, breathtaking scene he absolutely crushes in Call Me By Your Name, but for his supporting turns in The Shape of Water and The Post as well. The man was a tour de force this year and deserved to be recognized for as much. Other major snubs include The LEGO Batman Movie not getting into the Best Animated Feature category, but Boss Baby and Ferdinand doing so. Also, where is Weird Al's Original Song nomination for Captain Underpants or Captain Underpants: The First Epic Movie in general? That might make me more mad than Stuhlbarg! Shout out to Wonder (one of the best films of last year) for its single nomination in Makeup and Hair. Finally, can I just say how happy I am that Dunkirk did in fact receive as much love as it did and that Christopher Nolan has finally and rightfully been nominated for Best Director! The film, which racked up a total of eight nominations including a handful of technical categories that it could very well sweep (it will have to duke it out with The Shape of Water), as well as the aforementioned Director nod and a Best Picture mention makes it second only to Guillermo del Toro's film in terms of number of nominations. I hesitate to think it will take either of its two biggest nominations home, but one never knows. To that extent, I will post a full article of predictions and who I think will win as opposed to who I think should win closer to the date of the broadcast. In the broad stroke of things, The Shape of Water leads the pack with a total of thirteen nominations, followed next by Dunkirk's eight. Martin McDonagh's Three Billboards Outside Ebbing, Missouri, which won big at the SAG and Golden Globe Awards recently, grabbed a total of seven nominations though one of the more glaring snubs was that of McDonagh himself who failed to earn a Best Director nod. Darkest Hour and Phantom Thread each scored six nominations while Lady Bird and Blade Runner 2049 both netted five nominations each (Go Roger Deakins!). Check out the full list of nominees below and catch the broadcast on March 4th at 7 p.m. Eastern on ABC hosted by Jimmy Kimmel.